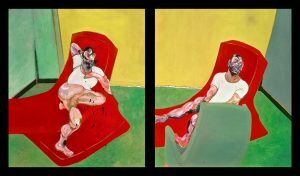 Margaret Thatcher described him as “that man who paints those dreadful pictures”…..Yet, the Tate Museum in London sold out two Francis Bacon retrospective shows. You may love or hate his work but Francis Bacon was famously known for his magnificent paintings of bold and emotionally charged raw energy. 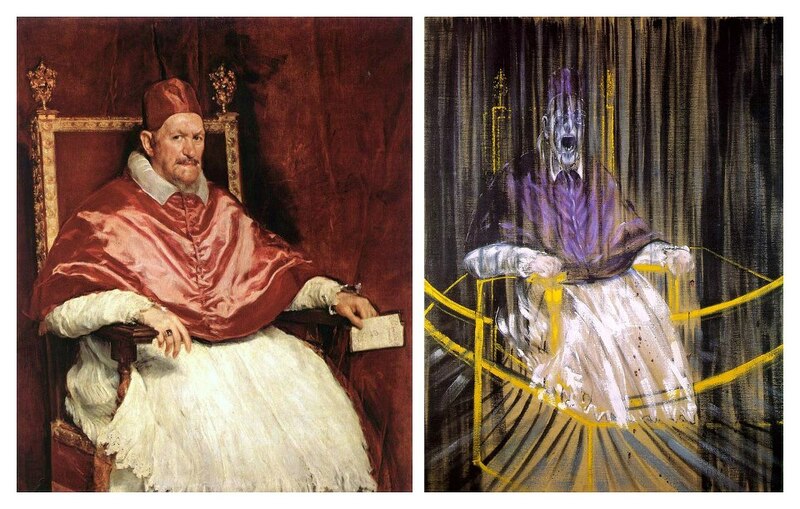 Bacon paints as if he were an old master from 400 years ago. His paintings drip with opulent color and a velvet magnificence. The pain and brutality that punches through them heightens their strange beauty. Artist Francis Bacon was born in Ireland and had a dreadful childhood at the hands of a cruel father. He lived through the grisly carnage of WWI and WWII and seems to have been driven mad by the temptations and horrors of the 20th century. In 1650 AD, Pope Innocent X was arguably the most powerful man in the world, “God’s representative on Earth.” He was also a suspicious, bitter, lewd and corrupt ruler of the church. Esteemed Spanish artist Diego Velázquez painted a beautiful portrait…but subtly hinted at Pope Innocent’s corrupt character and deep-seated deceit. Nothing subtle about Bacon’s interpretation of Innocent. Innocent X is a screaming victim, ludicrously drag-attired, trapped in evil, and manacled to an “electric chair.” As Hugh Davies, an authority on Bacon, writes, Francis Bacon gave us a “candid camera glimpse” of the pope. This painting is the pride and joy of the Des Moines Art Center in Iowa and is valued at more than $50,000,000. Visit Francis Bacon’s studio, unbelievable!